Premium leather single ear headstall with basket stamp detail. Engraved silver buckles and conchos with tie bit ends. 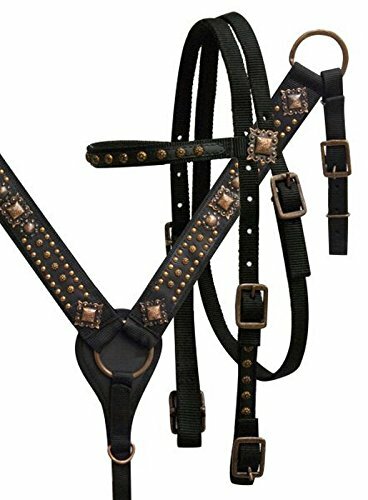 This BLACK nylon headstall and breast collar set is sized to fit a FULL SIZE HORSE. This set features double ply nylon with BLACK overlay accented with antique bronze conchos & studs. Adjustable cheeks with hook and loop ends. The breast collar is lined with soft neoprene. The matching nylon conway buckle reins complete this set. Brand NEW by Showman Products!! Hand crafted from the finest English leather. 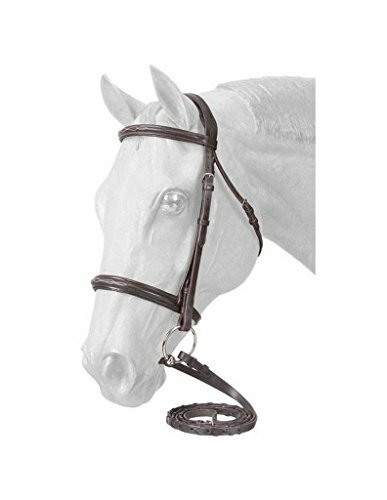 Features raised padded caveson and browband with white fancy stitching to add a stunning detail to the bridle. Padded shaped crown for increased comfort. Hook and stud bit and rein ends. Complete with ? wide laced reins in standard 54 length. Less bit. ShowmanTM Fine quality rawhide core show bosal with a cotton mecate rein. 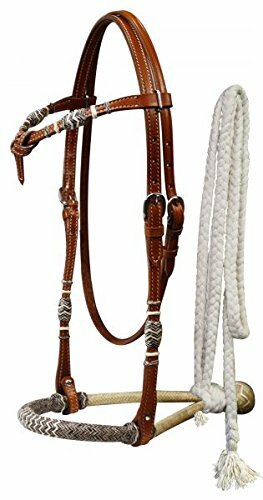 Quality 5 8 " futurity knotted headstall highlighted with rawhide accents and rawhide on the cheeks.Constructed with supple, doubled & stictched bridle leather and sturdy hardware.Set includes browband headstall and cotton reins Made by ShowmanTM Products. Tahoe Tack s Pleasure Rider series is composed of beautiful lather and nylon headstalls that are made with trail riding and other similar equestrian activities in mind. 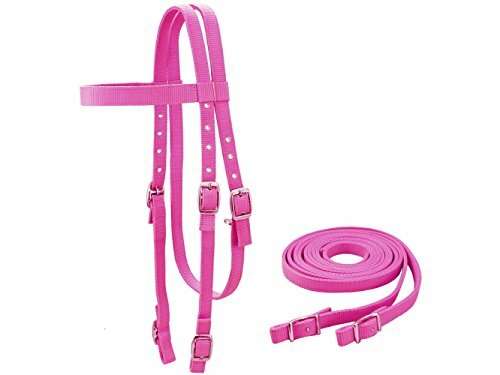 These halters are beautiful and high-quality, with durable, more plain designs that are suited to trail rides and pleasure riding. 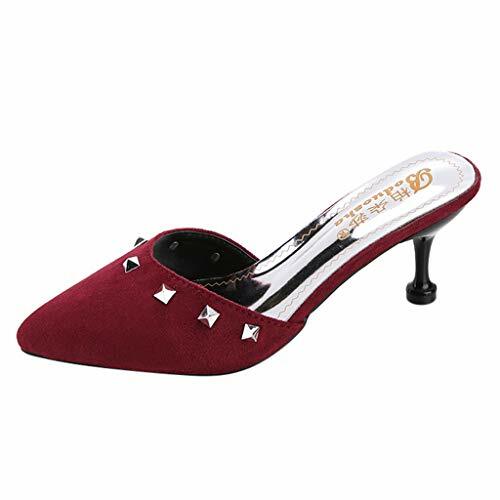 This series was designed with quality in mind and features classic western designs. MULTIPLE SIZES AVAILABLE - this headstall is available in Cob/Arab, and Full Horse, and Draft sizing to accommodate most equines large or small. MATCHING SPLIT REINS - this browband includes a pair of matching split reins that measure 79 long. Tahoe Tack's "Jewel of the West" collection was designed to dazzle in the show ring and is composed of only the most beautiful headstalls which are adorned with hand-tooled accents, conchos, show spots, crystals, and many other elegant features. These headstalls exemplify the beauty of fine western tack and are meant to highlight your horse's features and allow you to stand out in the show ring. 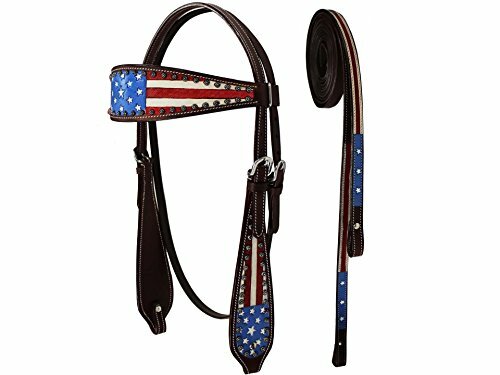 PATRIOTIC DESIGN - this matching browband and rein set features a hand-painted American flag design in bold red, white, and blue and is perfect for shows or parades. 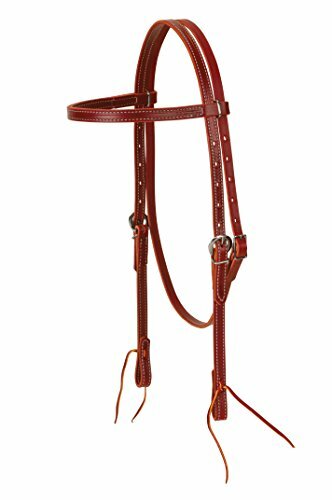 MULTIPLE SIZES AVAILABLE - this headstall is available in Miniature Horse, Pony, Cob/Arab, and Full Horse, and Draft sizing to accommodate most equines large or small. MATCHING SPLIT REINS - this browband includes a pair of matching split reins that measure 96 long. 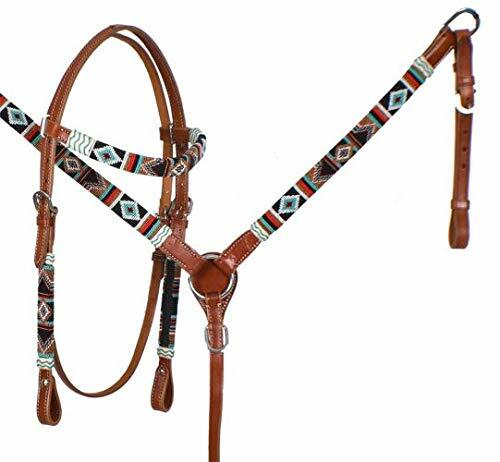 Showman Multi Color Navajo Beaded Leather Headstall, Breast Collar & Wither Strap Set! New Horse TACK! Showman Navajo beaded headstall, breast collar and wither strap set. This set features medium oil leather with a multi color Navajo design beaded inlay with white buck stitch. Headstall features a wrapped beaded ear piece and beaded cheek inlays. Wither strap double scissor snap ends and adjusts 23" -29". 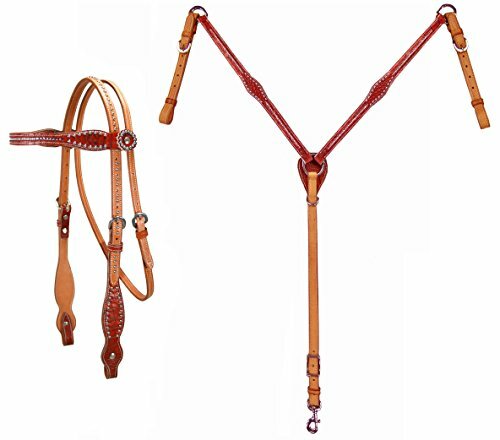 Headstall comes with leather competition reins with conway buckle and swivel snap end. Beautiful Classic style Headstall Breast Collar is made of Leather . Features Cross hand tooled and double stitched thick leather for durability. Stainless Steel fitting hardware . Right choice for your tack collection. 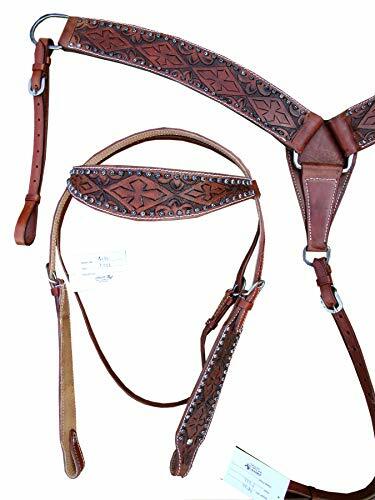 Product Description Western Headstall Western Breast Collar Double Leather Stitched Horse Size Hand Tooled Adjustable Throat Latch Stainless Steel Fitting Hardware 100% Premium Leather Great for Parade Rodeo Ranch Pleasure Trail Barrel Racing Show !! Showman Beaded headstall and breast collar set. This set features medium oil leather with a beaded teal, gold and black cross design overlay. Headstall comes with 5/8" x 7' leather split reins. A blanket protects your pony from cold and bad weather. Also, your favorite pony looks great with the light blanket. You can walk into the stable holding it by its halter. A cozy box with lots of fresh hay and forage is already waiting for your pony. Purple and White blanket and bridle! 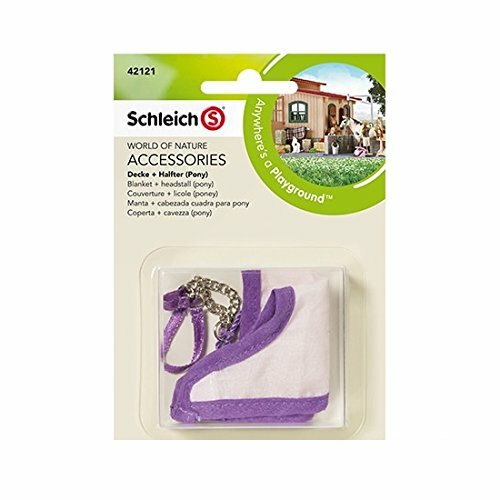 Great for caring for Schleich farm ponies! QUALITY CONSTRUCTION - this breast collar was designed by Tahoe Tack, a fine maker of quality western tack for over 20 years. It features durable hardware and high-quality leather that is designed to last many years with proper care. USA LEATHER - this breast collar is made with high-grade American leather from Wickett and Craig of Pennsylvania, and is extraordinarily supple, soft, and long-lasting. HORSE SIZE AVAILABLE - this breast collar is available in Full Horse sizing to accommodate most average sized equines. STAINLESS STEEL HARDWARE - this breast collar features high-quality stainless steel hardware that will not rust or tarnish, and remain beautiful for years to come. Hamilton 5/8" Complete Bridle Set for Ponies, includes headstall, reins, leather curb strap and jointed bit with shank. Conway buckles ensure a secure fit. Made of premium grade vegetable tanned leather, double stitch construction and hand rubbed for years of wear. The complete bridle set is a great value. Add to your American Flag tack with our new Patriotic American Flag Collection. Wow in the ring or on the trail with this handsome browband headstall. Hand painted with decorative sun spots on premium drum dyed leather. This adorable set comes in a variety of colors.This set includes every thing you need to hit the trail or to ride in the arena. Features silver plated heart conchos. MULTIPLE SIZES AVAILABLE - this tack set is available in Pony, Cob/Arab, and Full Horse sizing to accommodate most equines large or small. 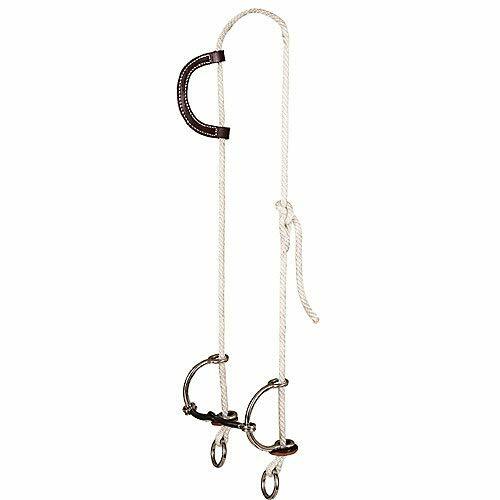 EASY ON AND OFF DESIGN - this tack set features clip ends on the headstall and reins, which makes attaching and removing them from the bit hassle free. SILVER HEART CONCHOS - this tack set features silver plated heart conchos along the browband and cheek pieces of the headstall, and along the breastcollar, which add a touch of flash to the set. The perfect reins for a hard days work! 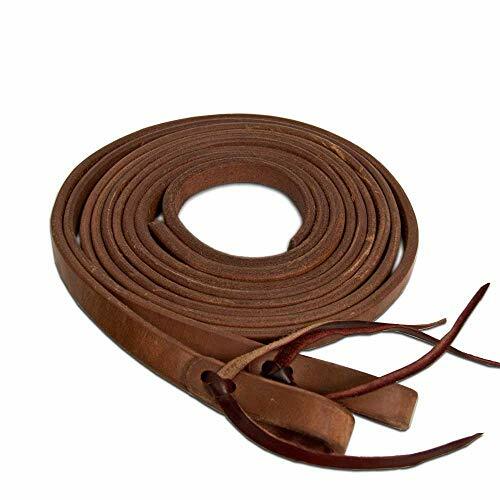 Teskey's leather heavy oiled split reins feature leather tie closure, and heavy oil finish. Available in 1/2, 5/8", and 3/4". 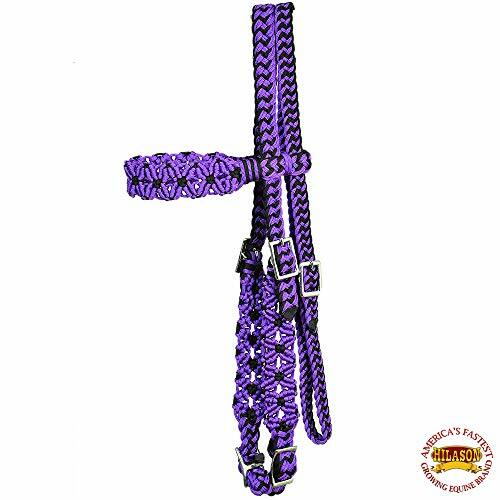 Snaffle Gag Bridle Made from 3/8" nylon rope and includes a 5" smooth sweet iron snaffle mouth bit with 3 1/2" cheeks. Bridle has a burgundy latigo slip ear. Features: Stainless steel rein rings. Constructed of durable 3/4 wide doubled and stitched nylon throughout. Trimmed in natural and black hand braided rawhide trim on brow, cheeks, reins and breast collar. 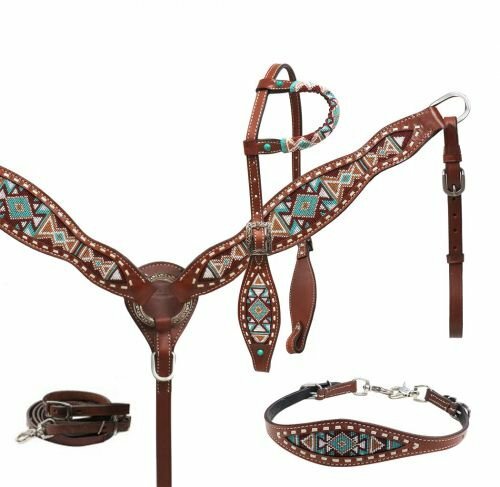 Showman Beaded Thunderbird 4 Piece Headstall, Breast Collar & Wither Strap Set! New Horse TACK! Showman Beaded Thunderbird 4 Piece Headstall and Breast Collar Set. This set features medium leather with a beaded Native American Thunderbird overlay with oranges, light blue, burgundy, white, and black beads. Set is accented with silver thunderbird conchos with turquoise stones and turquoise stone buckles. 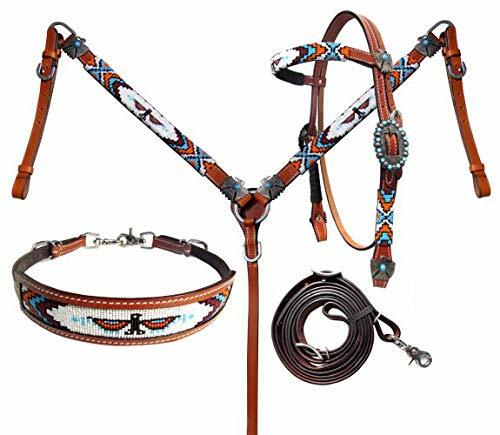 Set comes with browband headstall, breast collar, wither strap, and contest reins. Showman Argentina Cow Leather Single Ear Headstall w/Waffle Tooling & Turquoise Stones! New! Showman Argentina cow leather single ear headstall. 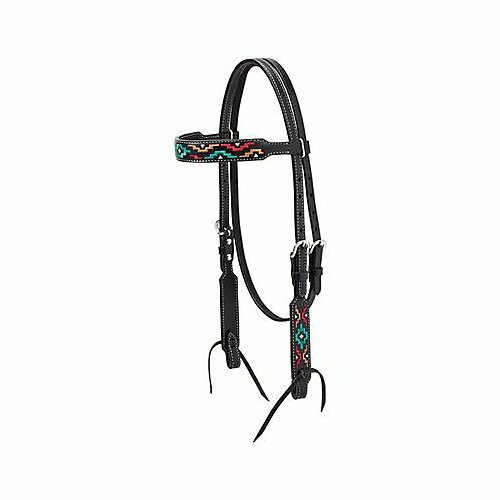 This headstall features medium colored Argentina cow leather with waffle tooling. Headstall is doubled stitched and accented with flower copper conchos and buckles with turquoise stones. 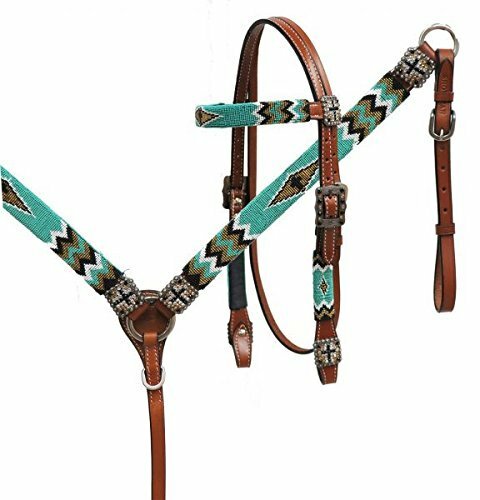 Showman Teal & Red Navajo Beaded Leather Headstall & Breast Collar Set! New Horse TACK! Showman Teal and Red Navajo Beaded headstall and breast collar set. This set features medium leather with a teal and red Navajo beaded overlay with natural and teal rawhide accents. Headstall comes with 5/8" x 7' leather split reins. For an average full size horse. This is a unique Headstall constructed of High quality Hand Woven Braided Paracord, carefully hand-made with all the required precision to give the most unique look in an arena or a trail. MATERIAL : Hand Woven Braided Paracord. COLOR : Purple / Black . Showman Beaded Arrow Design 4 Piece Set Leather Headstall & Breast Collar Set! New Horse TACK! Showman Beaded Arrow 4 Piece Set. This set features medium leather with a arrow beaded overlay with red, turquoise, and black beads. Set is accented with copper arrow conchos with turquoise beads and copper and turquoise beaded buckles. Set comes with single ear headstall, breast collar, wither strap, and contest reins.